I hesitated to write up this recipe because it’s just so simple to make. But, my husband took too many awesome photo’s not to share here…plus it’s not every day you get to bring down the basket of cookie cutters! True to its name, watermelon is a great source of water and is an excellent diuretic. One cup of watermelon provides 20% of your daily value of vitamin C and 14% the daily value of vitamin A. Because watermelon has such a high water content and lower calorie content than many other fruits, it delivers more nutrients per calorie, which is a pretty awesome health perk to a pop. 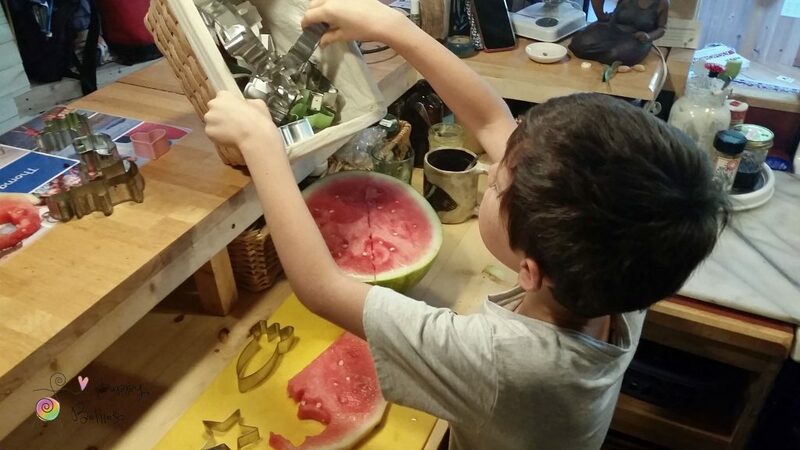 Slice watermelon into 1-2 inch pieces. Put a stick into the bottom center of your cut watermelon shape. 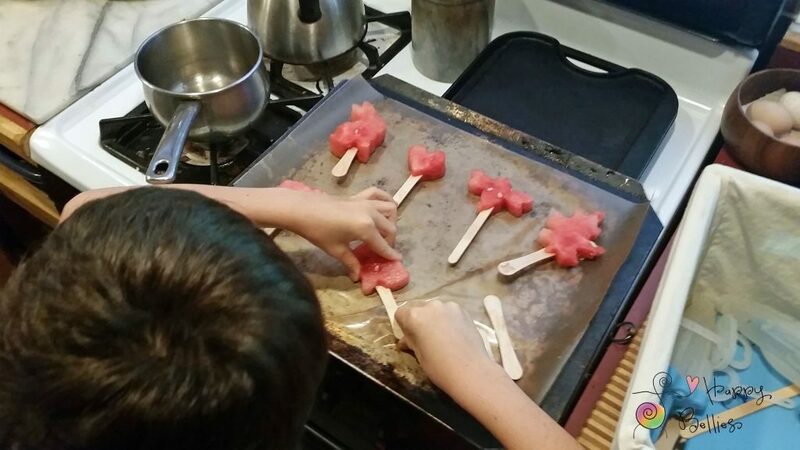 Place shapes on a cookie sheet lined with freezer paper. Or, freeze into ice cube trays (pour olive oil over each cube) or tiny containers. For those on Body Ecology Diet (B.E.D. ), this is best for once you have moved through both stages of the diet. A nerd word from your friendly nutritionist who specializes in good digestion – hence Happy Bellies 🌞 Watermelon, like other melon, is the easiest fruit to digest, requiring essentially no digestion when eaten alone. That’s the trick. If you eat watermelon with any other fruit (or food) you’re looking at one of the most difficult foods to digest. It’ll travel down to your tummy and stop whatever else is in there from being digested properly. The whole mess will ferment and cause gas, bloating, diarrhea, you name it. So don’t do it. It only takes 15-30 minutes to digest in an empty stomach so eat it first thing in the morning and start preparing the rest of your breakfast. By the time you’re done with that, the melon will be long out of sight. More on food combining.